For the first time in print, the first season scripts of The Harry Strange Radio Drama. A beautiful woman walks into Harry's office and asks him to recover some property stolen by her ex-lover. Harry surmises two things, she's not telling him everything, and she's rich. This is his kind of case. He takes the case, cashes her check and loses his taste for red meat for awhile. Much later, he'll discover those 'little stones' can mean the end to creation. Along the way to saving the world Harry fights demons, the mistress of nightmares, vampires, werewolves, Lilith, and a horrible little troll of a man named Mr. K.
To order your print version click here. To order your Kindle version click here. 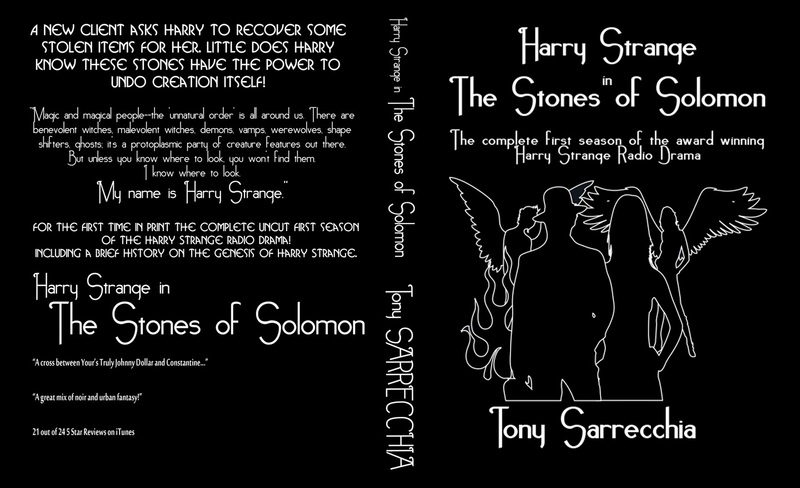 Harry Strange in the Stones of Solomon is copyright (C) 2010 - 2015 by Tony Sarrecchia. All rights reserved. No part of this story may be used or reproduced in any manner whatsoever without written permission of the author except in the case of brief quotations used in critical articles or reviews. This is a work of fiction. All characters, organizations, and events in the story are either creations in the author’s imagination or are used fictitiously.